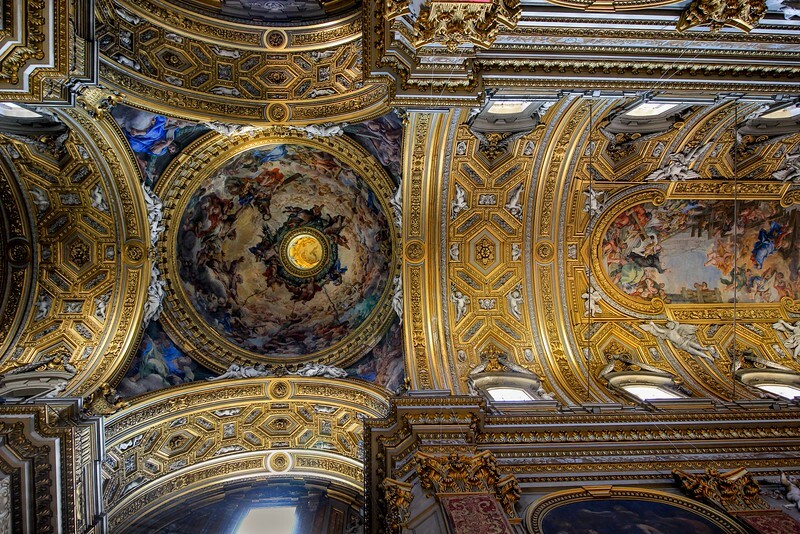 Prepare for what the tour guides call "church overload"- the eye and mind stretch that comes from studying the astonishing detail of the Baroque-styled Catholic Churches of downtown Rome. You will see wide view photos along with closeups to help appreciate the finer details unseen in global type images. Many of the 18 buildings in this gallery are easy walking distance from each other, and dozens more of Rome's 900+ churches have equally intricate details. Most of these images came from a whirlwind taxi tour in a non-stop 4 hour blitz, which was one of the most rewarding photo experiences I have ever had. Tripods are frowned upon, so every photo was taken hand held. A small bean bag helped stabilize some shots. Use the "pause" button at lower left to control viewing speed and read the longer captions. Enjoy. Chiesa Nuova in Rome. Built on church site dating back to the 1100's, the current structure was built from 1577 to 1606.